For the purpose of this review, I have received the books on English Language Arts, World History and Science. Everything You Need to Ace World History . . . kicks off with the Paleolithic Era and transports the reader to ancient civilizations—from Africa and beyond; the middle ages across the world; the Renaissance; the age of exploration and colonialism, revolutions, and the modern world and the wars and movements that shaped it. I am always on the lookout for books that could help my kids to grasp a certain topic like World History or Science for example. So when I stumble on these titles I though they would be great to have as reference for anything related to English Language Arts, World History or Science my kids might want to know. Already I know that I will use the World History and the Science one this year. The English Language Arts is always nice to have when they stumble on something with their grammar or writing. What I particularly like about these books is that the presentation of the information is original in itself. The sections are color coded in the book so you can easily glance the table of contents and then switch to the section needed. You will also find plenty of illustrations and graphs that will help to better assimilate the information and learn from the pages. Finally each unit concludes with a small “test” called Check your Knowledge. Answers are also provided for the student to check if he/she has the proper responses. The use of color through the page of this book will be attractive to a middle school student for many reasons. I recall using numerous colors when studying and this book will help to understand and comprehend a specific subject at hand. Besides, knowing that these books were created from the brains behind the Brain Quest products helps to know that the information within these pages will be accurate. Unit 1: Grammar: Phrases and clauses, subjective pronouns, objective pronouns, possessive pronouns, intensive pronouns, verbals, active and passive voice and verbs, verbs and mood, defining from context, Latin and Greek affixes and roots, reference materials. Unit 2: Language: figurative language, word relationships, nuances in word meanings. Unit 3: Reading Fiction: Types of fiction, objective summary, textual analysis and evidence, authorship and narration, setting, character, plot, theme, tone, poetry, fiction reading list. Unit 4: Reading NonFiction: types of nonfiction, textual analysis and evidence, authorship, central ideas and arguments, structure, nonfiction reading list. Unit 5: Writing: researching for writing, writing practices, writing arguments, expository writing – informative and explanatory texts, writing narratives. Also here’s a few pages of the book so you can see what it looks like. Unit 1: The First Humans – Prehistory – 3500 BCE: first humans and the paleolithic era, neolithic era. Unit 2: First Civilizations – 3500 BCE – 300 CE: Mesopotamia, Ancient Africa, Phoenicians and Israelites, Ancient India, Ancient China, Ancient Greece, Ancient Rom. Unit 3: Middle Ages 400 CE – 1500 CE: Byzantine Empire, Rise of Islam in the Middle Ages, early civilizations of the Americas, Medieval India, Golden Age of China, Medieval Japan, Europe in the Middle Ages, European Crusades in the Muslim World. Unit 4: Renaissance and Reformations - 1350-1650: Renaissance begins, Reformation. Unit 6: Revolution and Enlightenment – 1500-1865: scientific Revolution and the Enlightenment, monarchies rise in Europe, American Revolution, French Revolution, nationalism across Europe and Independence movements in South America and Haiti, American Civil War, Industrial Revolution, Women’s Movement. Unit 7: Era of Imperialism – 1800-1914: European quest for imperialism, scramble for Africa, Japan modernizes, Spanish-American War, reactions to colonization. Unit 8: World conflicts in the Early Twentieth Century – 1914 – 1945: World War I, Great Depression, political shifts after the war, World War II. Unit 1: Scientific Investigation: thinking like a scientist, scientific experiments, lab reports and evaluating results, SI units and measurements, lab safety and scientific tools. Unit 2: Matter, Chemical Reactions and Solutions: matter, properties, and phases, periodic table, atomic structure, compounds, solutions and fluids. Unit 3: Motion, Forces, and Work: motion, force and Newton’s Laws of motion, gravity, friction, more forces in everyday life, work and machines. Unit 4: Energy: forms of energy, thermal energy, light and sound waves, electricity and magnetism, electrical energy sources. Unit 5: Outer Space – The Universe and the Solar System: the solar system and space exploration, sun-earth-moon system, stars, galaxies, origin of the universe and our solar system. Unit 6: The Earth, Weather, Atmosphere, and Climate: minerals, rocks, earth’s structure, earth’s crust in motion, weathering, erosion, earth’s atmosphere, water cycle, weather, climate. Unit 7: Life – Classification and Cells: organisims, biological classification, cell theory, cell structure, cellular transport, metabolism, cell reproduction, protein synthesis. Unit 8: Plants and Animals: plant structure, reproduction, invertebrates, vertebrates, homeostasis, behavior. Unit 9: The Human Body and Body Systems: skeletal and muscular systems, nervous and endocrine systems, digestive and excretory systems, respiratory and circulatory systems, immune and lymphatic systems, human reproduction and development. Unit 10: History of life – heredity, evolution, and fossils: heredity and genetics, evolution, fossils and rock ages, history of life on earth. Unit 11: Ecology – habitats, interdependence, and resources: ecology and ecosystems, interdependence and the cycling of energy and matter, ecological succession and biomes, natural resources and conservation. Keep in mind that these books are written with a secular perspective but I still find that they can be useful for any homeschool as well as school students of middle and even high school. Two other titles are also available – one on Math and the other on American History. The Everything You Need to Ace Book (also known as the Big Fat NoteBook series) is available at your favourite bookstore, even on amazon.ca and amazon.com. It is the time of the year where children of all ages will go back to school whether you walk to go to the school down your street, take the bus to go to school, or homeschool. And when school supplies appear on shelves in store throughout the country you can be certain that new books are also available in bookstores. The Back to School Boutique at DK Canada is also available to find titles that will help your student (s) to develop new skills or learn about a specific subject. As part of the initiative to promote the books from DK Canada, I have received five titles that could be interesting for you and your child. Let’s face it, Canadian spelling is different in many ways from the American spelling. Homeschoolers from Canada knows where to find the best spelling program but since it is based on the American way of spelling, sometimes we would like to find a book that would help us to teach how to spell English words correctly in Canada. Well the Spell Check Canadian Edition could help you in providing a fun way to practice spelling. From homophones and contractions to how to use a dictionary, Spell Check covers all the spelling rules and exceptions your child needs to know, with loads of tips and tricks to help them spell correctly. Learn the tough words like "elephant" and "telephone," and remember which words have tricky plural endings. The book contains high-frequency sight words that help with both reading and writing, as well as engaging activities including word searches, crosswords, and jumbles. Spell Check is perfect for reluctant learners who will respond to humor and fun on the bright, colourful pages. The book is packed with images that will allow your child to better visualize some words. Though there is no grade associated with this book, I think it would be better for a grade 3 or 4 student. If there is one thing I want my kids to learn is to how to study properly. These skills will be able to equip them for numerous years to come because let’s face it – we always learn and you never know when study skills will come in handy in life. Help Your Kids with Study Skills is a unique step-by-step visual guide with invaluable advice on how to support your child's classwork, homework, and revision, with effective study methods that suit a range of learning styles for the third grade level and beyond. From exploring your child's preferred learning approach to using mind maps, flow charts, and mnemonic devices to handling test preparation and exam-day anxiety, this guide can help you place your child on the road to success. Jargon-free text and crystal-clear visual breakdowns help kids get their heads around tricky subjects, and a section covering math, science, history, geography, and other core areas provides subject-specific tips. The table of contents itself is pretty descriptive. How we learn: why we need study skills, helping a student to study, how the brain works, studying effectively, learning styles. Preparing and Setting Goals: getting motivated, active learning, taking responsibility, independent study, handling the pressure, staying well, study space, getting organized, concentration, do not waste time, dealing with perfectionism, the right mind-set, creating schedules, maintaining schedules, educational development. Getting and Working with Information: finding information, enhancing reading skills, evaluating information, engaging with learning, exploring learning styles, working with others, active listening skills, teamwork, project work, making notes, enhancing memory skills, developing thinking skills, what is critical thinking, enhancing critical thinking, reflective thinking, improving writing skills, breaking down the question, answering the question, building an argument, checking work, enhancing presentation skills, keep practicing, using computers. Online Study: equipment, types of sources, finding material, bookmarking, taking notes online, plagiarism, social media, virtual learning environments, safety online, revolution in online courses. Review Techniques: getting started, common problems with review, review timetables, using active learning for review, review cards, reading, notetaking styles, mind-maps, memory and the brain, flowcharts and mnemonics, more memory aids, memory and technology , know what is expected, review groups, peer and self-assessment. Exam Techniques: what is an exam, written exams, multiple choice, oral exams, other exams, hints and tips for exam day, getting final grades. Handling Anxiety: what is exam stress, coping with exam stress, healthy studying, time out, relaxation, visualization, and positive thinking, know when to seek help. Reference: this section contains summaries as well as various resources for each chapter. The book is packed with graphics, color, as well as great tips on how to study well. The first reaction of one of my kids when I told him I will schedule this book for him to read was “WHY?” but my husband explained to him that it was a great skill to develop and have in life. As a matter of fact, this book will be on the reading list of my high school and my middle school students this fall. Next spring, I will schedule it for my 6th grader so that he is fully prepare for next school year. Developed in consultation with leading educational experts, Coding With Scratch Made Easy is designed for children ages 9-11 and packed with exercises and activities to teach computer coding using Scratch, a free coding program from MIT developed especially for children. Help kids learn to code with Coding With Scratch Made Easy--Learn the Basics, Games, and Projects. Computer coding is quickly becoming a necessary and sought-after skill. It is being incorporated into the curriculum to ensure students understand the languages and uses of computer coding. Quick and easy to use, especially for kids who have no experience with computer language, Scratch is currently one of the most popular and largest technology trends for children, providing a gateway to more complicated coding languages. Loops – making things happen again and again. When the child has completed the book, he/she will have a good understanding on how coding can be fun and how you can make games and projects with Scratch. Then you might want to invest in other books which will help to develop their new skills. Step-by-step instructions teach essential coding basics and outline 18 fun and exciting projects, including a personalized birthday card; a "tunnel of doom" multiplayer game; a dinosaur dance party animation with flashing lights, music, and dance moves—and much more. Getting started: car art, dino dance party, animal race, ask Gobo, funny faces. Games: tunnel of doom, window cleaner. Simulations: virtual snow, fireworks display, fractal trees, snowflake simulator. Music and Sound: sprites and sounds, drumtastic. The book provide step-by-step coding in order to allow your child to learn while practicing. It will permit them to improve their coding skills and learn to create fun projects. Did you know that Bill Gates, cofounder of Microsoft, wrote his first computer program—a tic-tac-toe game—at age 13? Coding Games in Scratch shows how kids can start coding their own games, too, using Scratch, a popular free programming language. Essential coding concepts are explained using eight build-along game projects that guide young coders step-by-step, using visual samples, easy-to-follow instructions, and fun pixel art. Written for children ages 8–12 with little to no coding experience, Coding Games in Scratch teaches important strategies for solving problems, designing projects, and communicating ideas, all while creating games to play with their friends. Computer games: what makes a good game, atmosphere, types of games, how coding works. Getting started: introducing Scratch, getting Scratch, Scratch tour. Games: Star Hunter, Cheese Chase, Cicle Wars, Jumpy Monkey, Doom of the Broom, Dog’s Dinner, Glacier Race, Tropical Tunes. What’s Next? remixing and beyond, better Scratch, the next level, jobs making games, have fun. Hopefully by the time your child is finished with this book, he/she will have developed an interest in coding and have a better understanding on how that works. As you can see these books will help your child to develop new skills like learning to study or learning a language allowing him/her to code. Most importantly these books are pack with fun ways to learn something new. The Back to School Boutique has more titles available to help learn whether in geography, mathematics, science, music, handwriting, English, as well as different dictionaries. All the books mentioned above are available for purchase at your favourite bookstore, even on amazon.ca and amazon.com. This week the movie God’s Not Dead 2 is being released on DVD. I had the privilege to watch the movie on the net this week with my husband. As the title suggest it, this is the second movie with the words God’s Not Dead. Though this is a second installment on the issue of the name of Jesus not being welcome in public places, this movie is different that the previous one because this time around the problem start within the wall of a classroom of an history class in high school. A teacher who is loved by most of her students answer truthfully a question of one of her student. In her answer she quote some words from Jesus and by doing so gets into trouble first with the school and school board and then in court due to her refusal to sign a paper saying she has been out of line. I will not go into the details of the whole movie – which last about two hours – because then it would not make it interesting for you to check it out. However, let me tell you that there is also a couple of intertwined stories throughout the movie. And yes you will see the appearance of the Newsboys in the movie along with a few other prominent writers... The part we enjoyed the most was when these writers explained why the Gospels are reliable. If you have seen the first movie, you will recognize some of the actors but the main characters are new actors for the most part. The movie was okay I suppose. But I did not enjoy it as much as Miracles from Heaven which I wrote about not too long ago. There were times where I found the movie was a bit slow in transiting between the scenes. Personally I would have preferred to have a bit more action in the movie. However, the quality of it is above what you would expect for a Christian movie. Keep in mind that this movie is fictional – what I mean by that is that indeed there as been cases of teacher being sued for talking about Jesus in the past but the other issue for pastors mentioned in the movie is not happening at this point in time. Maybe one day it will come to it but I do not believe it will be in a near future. Finally, the movie contains numerous with positive elements from people sharing how their faith helps them through life, prayer examples, how we can encouragement one another as well as how to stand up for our faith in the midst of adversity. The movie God’s Not Dead 2 on DVD is available at your favourite store, even amazon.ca and amazon.com on DVD or Blu-Ray. I am delighted to present you a fabulous history curriculum which I know will not only introduce you to historical events but will also give you some information about the growth of the Christian faith through the years. The Mystery of History curriculum is for all ages – younger students (K-3rd), middle students (4th-8th), and Older students (9th – 12th). Depending of the age of your child you will find fun hands-on crafts, games as well as research projects for them. This is the third volume of a series of four. The first book covered from the Creation to the Resurrection. The second book concentrated to the history of the Early Church and the Middles Ages. This book covers the Renaissance, Reformation and the Growth of Nations. Finally the fourth book specifically presents the Wars of Independence to the Modern Times. The purpose of this blog post is to present what you can expect to discover while using the Mystery of History Volume III curriculum. At the end of January, I will write another blog post to present how we have used the curriculum during the months of August 2016 to January 2017. What is particularly interesting for us is that our homeschool coop will also cover the Renaissance period this year as one of our units. So receiving these items in time for us to discover and learn about Renaissance is definitively a blessing. This specific volume will cover the people and the events from 1455 to 1707. Not only will you learn about the Inquisition, Christopher Columbus, Michelangelo, Martin Luther, and many more but you will also see how Renaissance and the Reformation influenced Europe, which empires became wealthy in West Africa, learn about the Mogul dynasty in India among other things. As you can already realize this historical curriculum covers so much that you can’t help to anticipate what will be in the pages you read as you use it. Volume III of The Mystery of History has been divided into two books – a student reader which contains 84 lessons with colorful pictures, and the Companion Guide which includes the pretests, hands-on and research activities for younger, middle, and older students, memory card ideas, biweekly quizzes and exercises, timeline helps, maps, and supplemental books list. The reader is also available as an audio book (which we also received and you could use with the text in hand or simply take notes or color while you listen to it). The author herself is reading the text and background music adds life, drama and more meaning to the lessons. Volume II also offers a Super Supplemental Collection (in CD or PDGF format) which offers you challenge cards, coloring pages, notebooking pages, and a complete folderbook set. From what I have looked at right now, I particularly like the notebooking pages that contains questions that the student have to answer. I will be using this particular set of notebooking pages in the months to come. Rand McNally’s Historical Atlas of the World will provide information on all time periods and help the students to complete the mapping exercises in the series. It contains over 75 colorful, thematic maps which also include literacy, languages, religions and more. Rand McNally’s The Atlas of World Geography provides 65 physical and political maps of our present world which includes all nations and continents. You will be able to quickly see information about population, land use, climate, all presented with charts, graphs, and tables. The Mystery of History Tote Bag could become an essential item in your homeschool journey. This canvas bag display The Mystery of History logo and possess strong handles, a pen/glasses holder and a vinyl inner lining which gives it strength, durability, and protection for what you can carry in it. My first impression of this bag is highly positive. The bag is sturdy and is beautifully made. I personally plan to use it to bring my journaling bible things at the RV (on a regular basis until mid-October) as well as carry much needed books at coop in the fall. Please note that even if it is recommended that you have gone through volumes I and II before tackling this one, it is not necessary at all to do so. You can see example of activities with this book at the Mystery of History website. Needless to say that I am looking forward to explore what all these products have in store in the months to come as we embark on a journey of discovery with Mystery of History Volume 3 – Renaissance, Reformation, and Growth of Nations. 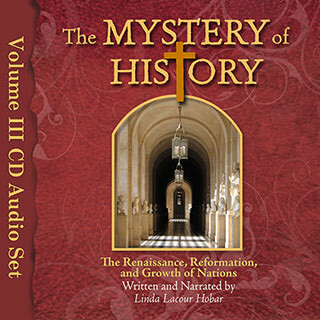 If you are interested in getting Mystery of History Volume III – Renaissance, Reformation, and Growth of Nations, you can get these at your favorite homeschool suppliers. Prices are as follow: The Reader 59.95$, The Companion Guide Paperback 39.95$ CD 29.95$ PDF 29.95$, the MP3 CDs 52.95$ Downloads 12$ for each quarter (there are four quarters) with or without music, the Super Supplemental Collection CD 64.95$ PDF 59.95$, the Rand McNally’s Historical Atlas of the World 14.95$, the Rand McNally’s The Atlas of Word Geography 16.99$, and the Mystery of History Tote Bag 10.00$. Note that all prices are all in US dollars. As I mentioned above, I will be using this curriculum for our history this year and plan to write a more detailed post on how Mystery of History Volume III was used in our homeschool. This blog post will be written sometime at the end of January 2017. Disclaimer: Thanks to the author of Mystery of History for sending me the above mentioned products for review purposes . I was not monetarily compensated for this review. Please note that the review was not influenced by the Sponsor in any way. All opinions expressed here are only my own. The 360 Siphon RV holding tank vent cap eliminates odors from the source — the holding tanks — and exhausts them out the roof vent before they have a chance to invade the RV living space. By design, the patented 360 Siphon can only create an updraft, expelling odors and fostering an oxygen-rich environment to speed up waste breakdown. Even environmentally-friendly tank additives can take up to 48 hours after use to fully oxygenate a standard holding tank. The 360 Siphon acts immediately after installation in any wind condition (with or without a breeze) to provide the ideal environment for proper decomposition, so caustic chemicals and perfumed cover-ups are no longer needed. The 360 Siphon can be refitted to any RV in less than 20 minutes with a screwdriver and a putty knife (to scrape off any old sealants). The 360 Siphon replaces factory-installed vent caps and is a permanent, one-time, maintenance-free application. We have an RV for over 10 years now. And this year we finally found a campground where we can put both the RV and our boat for a reasonable price. But we started to notice something with our RV when we would come after a week away from it – the smell of the sewer. It was bizarre because we never really experience this in the past. It was really bad for my husband who had trouble sleeping the first night due to the smell. Me? I guess my nose is not as sensitive as his since I didn’t really smelled anything wrong. On of our kids also smelled it – the others not so. So obviously this child of ours inherited the sense of smell of dad. After some research on the internet, my husband found a video explaining how the 350 siphon worked. We wondered if it would be as fabulous as it sounded. So I decided to approach the company in order to see if we could review two 360 siphon – one for the black tank pipe and one for the grey tank pipe. Within a week I have received the package and we were looking forward in installing them. Here’s picture of the tip of our RV before the installation which clearly show the two pipes. Turns out that my in-laws were coming camping with us when we were planning to install these. My father-in-law is a very handyman and loves doing that kind of jobs. So both him and my husband climbed on the top of the RV in order to remove the older caps and install the 360 siphons. The installation took about 40 minutes or so. And the new 360 siphons were immediately put to the test. Did we see a change? We did. On the day of the installation, my husband said that he had smelled a difference but the real test would be when we leave the RV for an extended period of time and see if there was a smell when we come back. When I mention extended period of time, I mean closing the RV because we are going home and come back a week or two later. So when we left on Tuesday and came back on the Friday, I was curious to see if my husband would smell the sewer or not. Turns out that there were no smells whatsoever and he was very pleased with the results. The next day he even pushed the test even more but keeping the toilet open for 5 to 10 minutes to see if the smell would bothered us. Believe it or not nothing came out of the hole – NO SMELL AT ALL. Complete success for the 350 siphons! Consequently, we are highly recommending the 360 siphons for all RVers. It will make a huge difference and make you stay more interesting whether you stay put at one place or travel through the country with your RV. The 360 siphon has an universal fit 5 1/2” diameter by 2.5” height. Installation is very easy to do with clear instructions included in the package. I also recommend that you get one for the black tank and one for the grey one.